I have an uncanny ability to recognize faces. I could give you lots of examples. From being in a new city and spotting the one person from my hometown, to making a quick connection with a complete stranger while waiting in a line that makes him laugh which then imprints his face on my brain, to obscure actors (now made famous after a bazillion parts and cancelled TV shows, because of one popular American series – that I do not watch) who pop up in an old TV series on Netflix – such as Poirot. 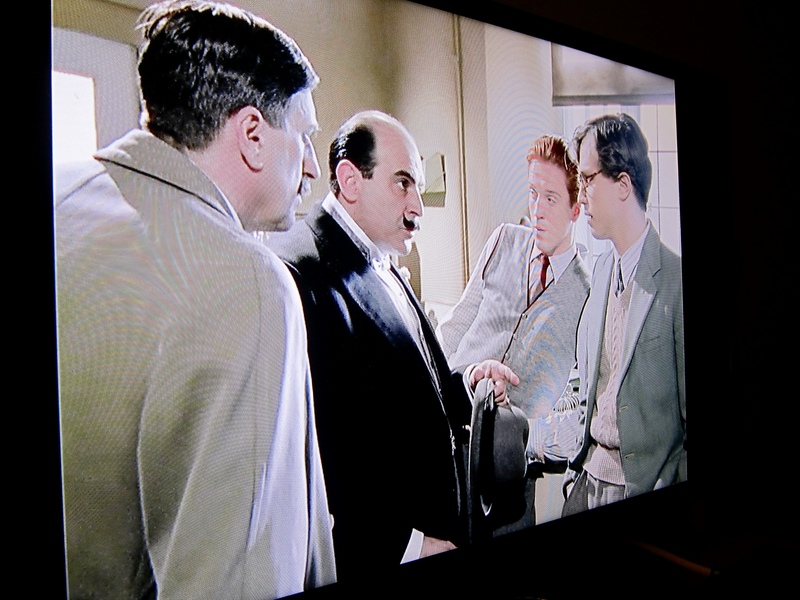 You remember Poirot, don’t you? Super. Oh, yeah! I know that guy! Just for fun, I’d love to see your best guesses** in the comments! **I wish I could have captured an image from his first scene because now when I see this picture it is just so obvious. Oh well. Today I need a bit of an extra boost. These days are a challenge for everyone, so I’m sharing! Mini Eggs have 210 calories and 28g of carbohydrates (not to mention 10g of fat, 6g of which are saturated!) for 42 grams, or about 17 eggs . Hmm? Whassat? Oh, no. No reason. Just a random fact*. Maaaayyyybe I found the hidden Mini Eggs. Maybe. Who’s to say? It’s a mystery, really. Anyway, before I do any more damage to my plans, and to circumvent any damage you might be about to do to yours, I thought I’d come and share these facts with you. The truth shall set me free. Contradiction. It’s a fact of life. A life I’d like to keep living for a really long time. Now excuse me while I take those seventeen Mini Eggs and disperse them between the Things’ Easter baskets. They won’t divide evenly and though that could drive me mad, I will not eat another stOOpid egg! One Thing will just have to get an extra egg. It all evens out in the wash, as they say. Oh, and I have also sealed the bag and tossed it way up into the cupboard of sin that I can’t reach. So, how is your Monday going? What is motivating you today? Whatever it is, I hope you have it in abundance. *Here’s another fact: I ate another Mini Egg when I went to get the bag to check my facts. Somebody stop me! In 12 minutes Meatless Monday will turn into Taco Tuesday and before that happens I need to share an official Meatless Monday meal with you. In the interest of joining in on a movement that takes some very nice steps towards sustainability for our planet, I have decided that we at Chez Peady will be taking part in Meatless Monday on a regular basis. I have been thinking about it for a while and with a storm brewing in the Atlantic Ocean and creeping up the coastline, today seemed like the perfect day to start. I had absolutely no desire to fight the crowds of storm chips shoppers at the grocery store and since Thing 2 was home from school today (still fighting the most recent bug – such a hanger on, this one!) it made sense to just stay put and shop my own pantry. Still, when I did that I was not quite feeling inspired, so in typical Peady fashion I took to twitter to ask my tweeps (the coolest tweeps, fyi) for Meatless Monday ideas. As usual, the Twitterverse did not disappoint. I went off to hang out with Thing 2 and when I returned there were no fewer than 7 suggestions for delicious, nutritious, make-it-right-now, ideas for Meatless Monday. I knew for tonight, I wanted an extremely easy dish, but one that was also big on flavours and appealing to Thing 1 and Thing 2. Pasta seemed a logical choice. I went to the kitchen to gather the goods, so that when suppertime rolled around I could simply work my Peady Powers and whip up supper in no time flat. What did I come up with? Well, I made Gluten Free Spaghetti in Tomato Sauce with Chickpeas and Parmesan. I also made some oh-my-goodness-it-smells-so-good Cheesy Garlic Bread to go along with it. If there’s one thing I know about my family, it’s that garlic and cheese bring these people joy. Throw that cheesy, garlicky goodness onto a carb and well, stick a fork in them, they’re done! It could not have been easier. Open a can of Chickpeas. Call them Garbanzo Beans. Laugh. FOCUS! Strain the Chickpeas and rinse under cool running water*. Add sauce to the empty stock pot (this is where I cooked the pasta). Toss to coat everything well. Serve immediately or cover it and make some yummy garlic cheesy bread. Turn oven to 375 degrees. Slice carb of choice (bread, rolls, what have you) and place on a baking sheet. Spread a bit of butter on the bread and sprinkle liberally with garlic powder. Bake until the carb is toasty and cheese has melted. It was really good and totally meatless! I do believe that is what the people like to call a win-win. I would make this again. In fact, I will. Next Meatless Monday, I will make a new recipe thanks to all the helpful tweeps who were so sweet and generous with ideas this morning. I will post our Meatless Monday experiences for the next little while as we try something new and see if we can’t make Meatless Monday a regular thing at Chez Peady. *Rinsing canned beans in this way can reduce the sodium content by about 40%. Always rince canned beans. You could also cook your own from dried. Another post for another day. ***If not sooner. Otherwise you run the risk of eating all the garlicky, cheesy, gluten-y goodness!